There's an understandable fear amongst First Nations that leaving the land will destroy their culture. They fear the destruction that might come with modernity; that they'll lose connection to their ancestors, to their Mother Earth, to which they are deeply embedded, and become assimilated like so many cultures before them. Fear is our greatest enemy. Erich Fromm wrote about the flight from freedom that comes from fear of the unknown future or change. There is a primal pull to the past, to what's known, even if that life is non-sustainable or for some, no longer available. Many of us have heard the words of our parents as they bemoan the present, the fast pace, and then we listen as they reminisce about the past, sharing wonderful memories of how it was then. The joy of nostalgia. But, there's no going back to those times. They are gone. And not all of them were as idyllic as remembered. Irwin Cotler made this interesting comment. He referred to the Jews as the "Original Aboriginal People." Perhaps there are lessons that can be learned from these original aboriginals. The story of the Israelites in the desert being led by Moses to the Promised Land is the archetypal story of fear. It took only a day or two away from enslavement in Egypt before the Israelites yearned to go back to the known even though it was against their best interests. Freedom scared them. There's a sense of comfort in the known, in the past, that makes it difficult to accept new ways, new ideas. Cultures that refuse to change, to transform to new realities die. That's historical fact. Think of the many cultures throughout history that have disappeared, some for which we've no account, and others now only known by artifacts or bits and pieces of written history. 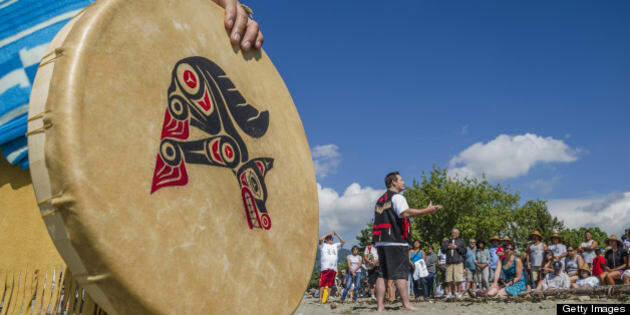 Rather than focus on the cultures that have been lost, First Nations can focus on the one that has survived thousands of years, in exile, away from its land, its holy places and spaces and know that their culture will not only survive, but thrive. Acculturation, integration, is not a death sentence. It can strengthen one's connection to one's past, one's culture, to one's ancestors. The Jewish people have not only faced cultural genocide for thousands of years but live under a constant fear of genocide. They lost their Temple around which the entire religion was based. Sacrifices at the Temple, and the in-gathering of all the people to Jerusalem for the Holy Days made the religion and culture place based. When the Jewish people were sent into exile, into Babylon, Jerusalem, the heart of their religion, was colonized and sacked; the Temple built by Solomon was destroyed. Yet, the people survived in the diaspora and then returned to live, again. The fall of the Second Temple and the razing of Jerusalem by the Romans in 70 CE didn't destroy the people or the religion. Although the vast majority of Jews were dispersed and the land ecologically destroyed (trees removed, the earth salted) Judaism endured, transformed into a portable religion and culture, wanting but no longer needing to live on the land to provide their identity. Sacrifices were turned into prayer times. Holy days were celebrated wherever the people lived. Always, though, the memory of the Temple, of Jerusalem, and one day returning to the holy places and spaces remained alive in words that were written down, in prayers that were offered, songs that glorified, in rituals and symbols that became part of the soul, individual and collective. After thousands of years in exile it was the Enlightenment, two hundred and fifty years ago that almost destroyed the Jewish people. Released from ghettos, allowed to become free citizens of the countries in which they lived, many gave up all tradition, all connection to their Judaism. Those who stayed transformed the religion, many bringing it in line with modernity. Not without great growing pains. And many more rediscovered their roots, living within other cultures. In the not too distant past, the Jewish people faced total annihilation: the Holocaust. Those who survived have lived with a break between the past and the future. Those who died took with them the memories and stories leaving a hole in the collective soul. The First Nations/Aboriginals have had to face something similar. Hate: for being different. They, too, have had a break from past to future: the wanton murder of their ancestors; their ancestral homes destroyed; the residential schools; the attempt by others to assimilate them into a larger, different culture, by demeaning theirs. Their children, today, have lost touch with ancestors who knew the "old ways." But those ways can be reclaimed. Clarence Louie, Chief of the Osoyoos Band found a way to embrace the present while holding on to the past. Since founding the Osoyoos Indian Band Development Corporation in the early 1980s, the reserve has launched more than half a dozen major projects, including a luxury resort, golf course and a construction company. The band's vineyard, planted before Louie was named chief, now operates as Nk'Mip Cellars, and has won awards as the top winery in B.C. The money earned helps preserve the reserve's desert ecosystem. Aware of the danger of losing the connection between past and future, Chief Louie opened the Nk'Mip Desert Cultural Band providing programmes that teach the next generation their culture and language. He ensured these programmes were paid for by the businesses run by the Band. "Everything costs money -- talk is cheap, whether it's environmental cause, cultural causes, spirituality, religion," says Louie. As the Jewish people, for thousands of years, "remembered" Jerusalem and all that living in Jerusalem had meant, so too the First Nations can keep alive their ancestors' life on their ancestral land, and in the "diaspora" of Canada, the country in which all their ancestors were born and buried. The love of Mother Earth, like the love the Jewish people have for God, can be maintained and celebrated anywhere. History teaches us that although children move away from their homes within their ethnic communities, once confident in their place in the world, they tend to return to their rituals, symbols, and belief systems, and their homes with greater pride and commitment. New rituals can be layered on to the old to remind all future generations of their ancestors' love of and connection to the land. Stories about the connection to the ancestral land can become deeply embedded "memories" that give meaning to everyday life. Will Durant, author of The Story of Philosophy wrote about memory. "In ourselves, memory is the vehicle of duration, the handmaiden of time; and through it so much of our past is actively retained that rich alternatives present themselves for every situation. As life grows richer in its scope, its heritage and its memories, the field of choice widens..."
The difficulty all cultures face when dealing with either unexpected or unwanted change is the need to define the ties that bind them to the past and the bonds that need to be broken to gain access to a fruitful future for their children. The Osoyoos Indian Band's corporate motto is "In Business To Preserve Our Past By Strengthening Our Future." Success also requires letting go of anger towards others. Chief Louie has chosen a different path than others towards justice and peace, capitalism and even colonialism. Chief Louie encourages all natives to let go of their "defeatist attitude which continues to hobble" them. "No more whining about 100-year-old failed experiments. No foolishly looking to the Queen to protect rights." Finding a balance between "old ways" and the inevitable march of modernity is a bittersweet task. It contains sorrow, mourning for a past that must be released. But it is also a moment of great expectation and exhilaration because it comes with great hope and possibility for future generations.